Is Our Existence on Earth Merely for Our Testing? I’m sure all of you have wondered what is the purpose of life. When you ponder the vastness of the universe and the intricacies of the plants and animals in nature, you feel that humans are too insignificant to matter. Or even if we do matter, what could possibly be the purpose of our existence? If you are a Christian, you might quickly answer, “God.” But what purpose does God have in placing humans on earth for a relatively short time before they die? When I was younger, I heard many people say that we are on this earth merely to be tested by God. The idea seemed to be that God created humans, placed them in the arena on earth, and gave them some arbitrary standards to live by. Those who did receive eternal life in heaven. Those who didn’t receive eternal life in hell. By no means is this a prevalent view among Christian theologians; at least, it is not prevalent as far as I can tell. Some theologians argue that our ultimate purpose on this earth is to bring glory to God. Others argue that our purpose is to be a people for God, a people with whom God can dwell. And I’m sure there are many, many other positions among Christian theologians. I am not certain how to best describe the purpose of our existence. I lean toward the “to give glory to God” position, but I am not settled in this. 1. Throughout history, a significant percentage of humans died before they reached their first birthday. If God’s purpose in creating us was simply to test us, then why have so many humans die before they are capable of choosing whether to follow God? Remember that before modern medicine a significant percentage of children didn’t live to see their first birthday. This would mean that God designed a test for humans for which a significant number of humans cannot actually “take” the test. If that were true, God designed a bad test! 2. It doesn’t explain the different stages of salvation history. If our existence was merely a test, then why did God would God see the need for a new covenant? If God were testing mankind, did he decide to change the test? Again, it seems like that there is more at work than a mere testing of humans. 3. Many people throughout history had no exposure to God’s special revelation. If God wanted to test humans, then why has the special revelation about God not been available to everyone? (Even if you think that what nature reveals about God is sufficient for someone to come to a saving knowledge of God, people who only have this information are at a disadvantage compared to the people who have received this knowledge plus knowledge of the gospel.) This, too, doesn’t make sense to me. If God merely wanted to test humans, then it would seem most sensible to give all the same test. Then there would be no question about whether a person had poorer information than another. If I wanted to test a classroom of math students to see which ones could pass an exam, would it make sense for me to give some all the questions, some part of the questions, and some none of the questions? Is that a good test? No. If you saw me doing this in a classroom, you would conclude that I wasn’t trying to test the students’ math abilities. For these three reasons, it seems to me that God’s purpose in our existence on earth was not merely to test us. 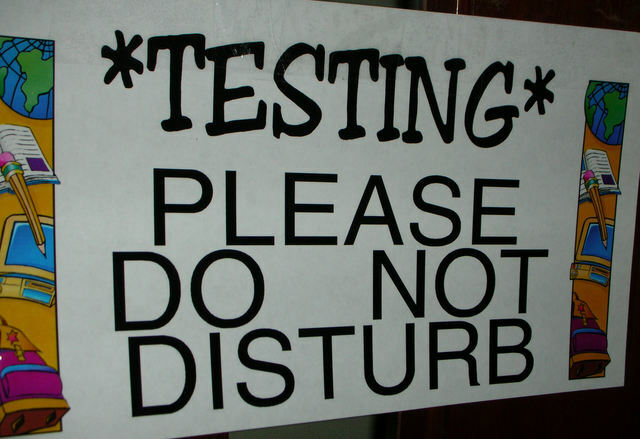 I have stressed “merely” several times, because I don’t deny that a testing is involved somehow. But I don’t think it is the ultimate reason for our time on earth. You might not think that our existence on earth is merely for our testing. Good. I don’t. But I remember hearing many people saying it when I was younger. And for the reasons I’ve given, in addition to Bible passages that suggest other purposes for our existence like bringing glory to God, I don’t believe that a mere testing sufficiently explains our existence on earth. I’ll leave it to you to read and to think about what the best explanation is. For this post, I’m content showing that it isn’t a mere testing by God. If God Is Love, Does That Mean He Is Free Not to Love? Habit or Experience: Which One Is More Important in the Christian Life?